The students were divided into two groups of six. One group going to Mae Chaem and the other to a village so small that no one could find any information about it on the internet. Our plan was to spend two weeks with each group. We would go to the unknown village first. When we gathered at Siam TV in Chiang Mai to meet the vans that would take us to our respective villages, the students going to the tiny village started asking questions. Rand’s answers were always the same. Are we staying in homestays or people’s houses? With eleven of us packed into the van, we headed up the winding mountain road. Luckily, I had seen some students taking Dramamine and I followed suit. Two hours into the trip, we had to stop for one student to walk around a bit (and I think throw up). A little while after that, another student didn’t have time to ask the van to stop and loudly vomited into a plastic bag for several minutes while the rest of us pinched our noses, plugged our ears, and closed our eyes. I have never heard such an awful sound, think Chewbacca emptying the contents of his stomach. Later we found our that a third student had also thrown up, but she did it so quietly and discretely that none of us realized. Finally we arrived at the government building in a small town. With the help of one of the students who speaks Thai, we were told to put our bags in the cab of a truck and then get back into the van to ride to a place to eat lunch. I was pretty sure at this point that all of stuff was going to be stolen. But I dealt with the uncertainty and enjoyed a lunch of fried rice and noodles before we all climbed into the back of a truck to ride the last 11 km up a dirt road to our real destination: Mae La Oop. 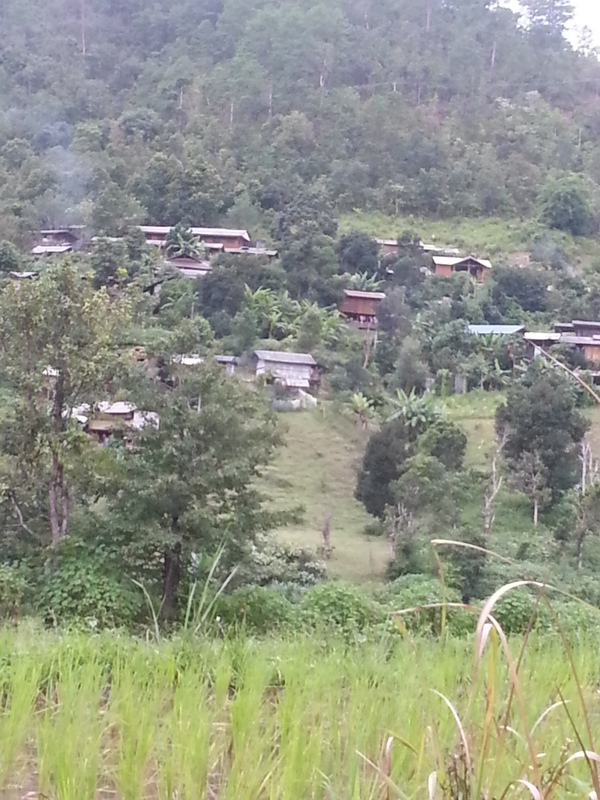 Mae La Oop, a village with Thai and Karen people, raised wooden houses, dirt roads, one school, a church, and a Buddhist temple, would be our home for the next little while. Our packs arrived safe and sound. And eventually our questions would be answered. We will live in people’s homes. We will sleep on mats on the floor, just like they do. We will shower by pouring buckets of cold water on ourselves, just like they do. And yes, there will be wifi . . .sort of. We learned these things and so much more during the next two amazing weeks as we experienced a different kind of life in rural northern Thailand. What a grand adventure you all are having. Yes, I am envious but kind of relieved that I don’t have to sleep on a mat on the ground. I do like some comforts in my old age.